In the last decade, the notions of topic and focus have come to play an increasingly relevant role in theoretical linguistics. Although these notions are often taken for granted, they are still poorly understood. This study offers a detailed analysis of the precise definitions of these and related terms (theme, topic, background, given information, focus, contrast, etc.) as well as of their combination into information structures such as the topic-focus and background-focus articulations. It recommends pursuing a feature-based typology of topics and argues against a dual nature of focus (i.e. presentational vs. contrastive). Central questions addressed are the analysis of subjects in Spanish and English (DP vs NP and null vs. preverbal vs. postverbal) and the nature of constructions such as topicalization, left-dislocation, and focus preposing. 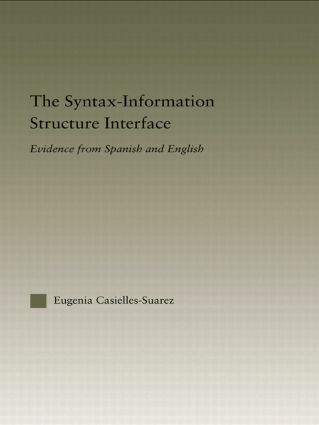 Further, it is proposed that in Spanish information structure can be read off the syntax: while an overt DP in the preverbal specifier subject position is interpreted as the topic in a topic-focus articulation, one or more left-or right-dislocated phrases are interpreted as part of the background in background-focus/focus-background structures.